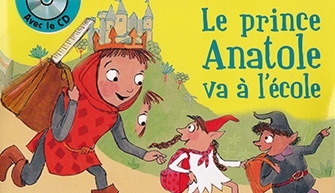 This summer I recorded a story entitled « Prince Anatole Goes to School » which is part of Bayard Presse’s collection of « beautiful stories”. I did the narration of course, but I also did all the character voices. It was a complex and fascinating job and I really enjoyed myself – just like a kid ! I had to avoid the tempting trap of “overacting” the roles. By working with the director and the team from Bayard Presse, we were able to come up with the right tone for each character in order to best support the story as well as captivate the children who will be listening to the CD which is sold with the book. a fairy (yes I did!) as well as Gargouillard, the terrible child eating monster ! The story came out on August 25.